I have found that this equation in minerals gets a lot of attention but little understanding as to why it is so important. Therefore, I would like to keep this simple and stress that a horse fed a diet based on quality forage should not have any issues with this, and their owners should have little concern. When I see diets that are heavy in grain or a particular feedstuff (let’s say rice bran) then I will do a ration analysis to make sure this ratio is not out of whack. Here’s why. 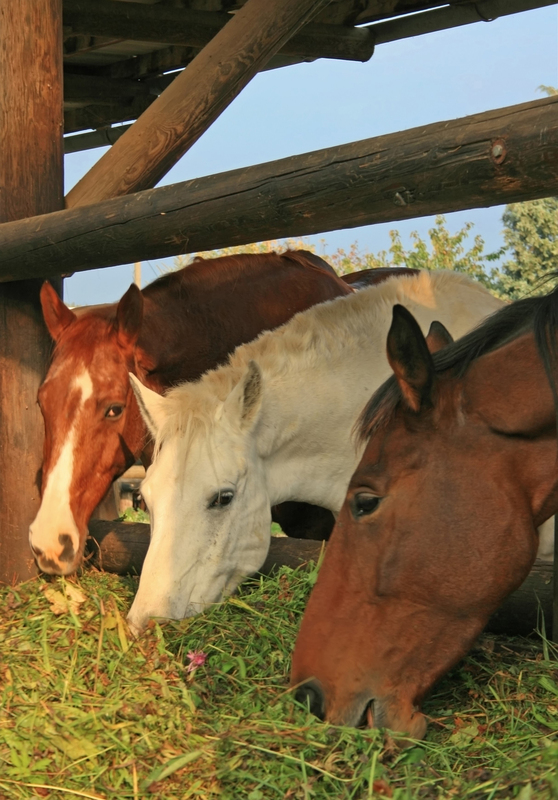 Besides salt, Calcium and phosphorous are the two critical minerals needed in horse nutrition. Calcium and phosphorus are the most abundant minerals in the body, making up 70% of the total mineral content. They are both macro minerals and needed in large quantity by the horse. In contrast, the micro minerals such as copper, iodine, iron, manganese, selenium, and zinc are required by the horse in small (trace) amounts. As with humans, Calcium is necessary for strong, healthy bones with 99% of the Calcium in the body being contained in the bones and teeth. In the horse it plays a vital role in maintaining strong and healthy bones, cartilage and joints for performance without injury/breakdown. Other less known functions of Calcium in the horse include roles in metabolism, nerve impulses, heart and diaphragm contraction and the functioning of the GI muscle for digestion. Calcium also has a role in specific metabolic reactions such as blood clotting, normal cell membrane function, glandular secretion, temperature regulation, regulating activity of many enzymes, and cellular activity. Phosphorus has some pretty significant jobs in equine nutrition as well. 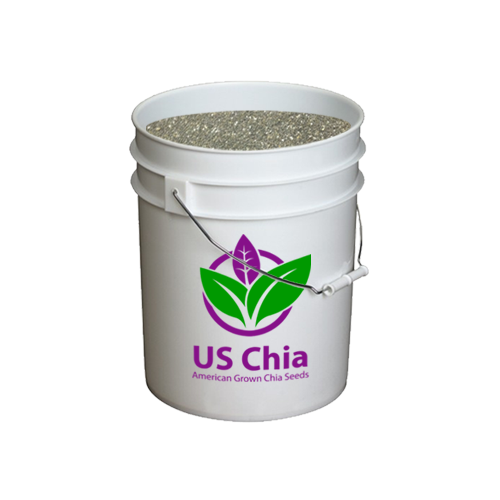 It helps regulate muscle and heart contraction and cell integrity. Another important role is in glucose use; specifically it is involved in the production of adenosine diphosphate (ADP) and adenosine triphosphate (ATP), both of which are major energy units for your horse’s cells. 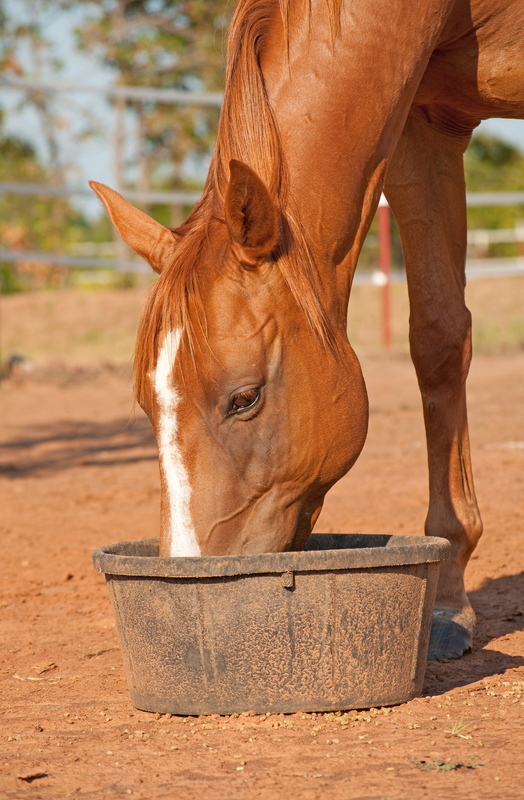 How Much Calcium and Phosphorus Does My Horse Need? 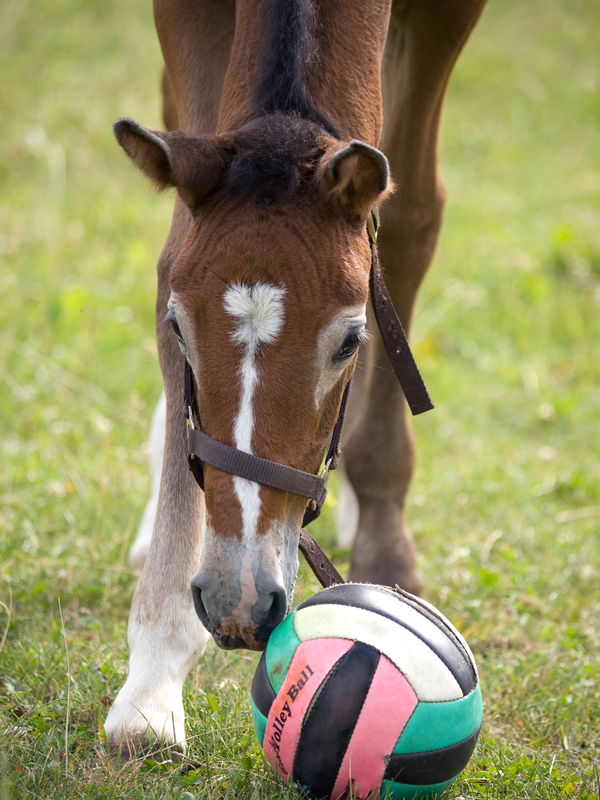 The Calcium-phosphorous requirement is greatest during the first year of a horse’s life when the horse grows to approximately 95% of his adult height. In contrast to the young horse, the requirement of mature horses is low. Table 1 indicates the Calcium-phosphorous requirements for a horse which is growing to a mature weight of approximately 1,100 pounds. Knowing the role Calcium plays in bone development it is not surprising to see the requirement for a lactating broodmare is over twice that of a mature horse at rest. Why All the Fuss About the Ratio? 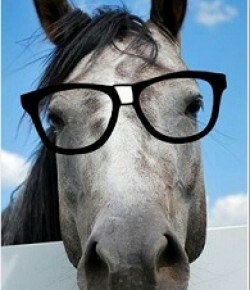 Simply put, a horse needs at least as much Calcium in his diet as phosphorus, never the reverse. 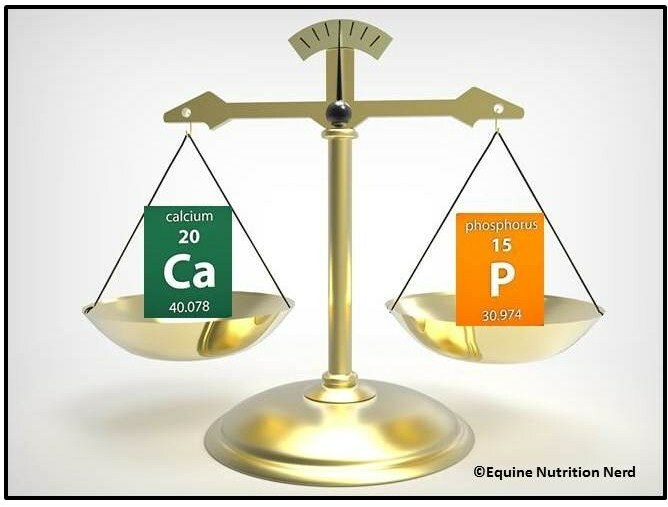 There is a saying in equine nutrition “as goes phosphorus, so goes Calcium” meaning that for every gram of phosphorus in your horse’s diet there should be at least a gram of Calcium for the phosphorus to be absorbed properly. With this relationship in mind, a ratio of 1 to 1 should be adequate but it is probably better if the horse’s diet has more available Calcium to facilitate the absorption of phosphorus. 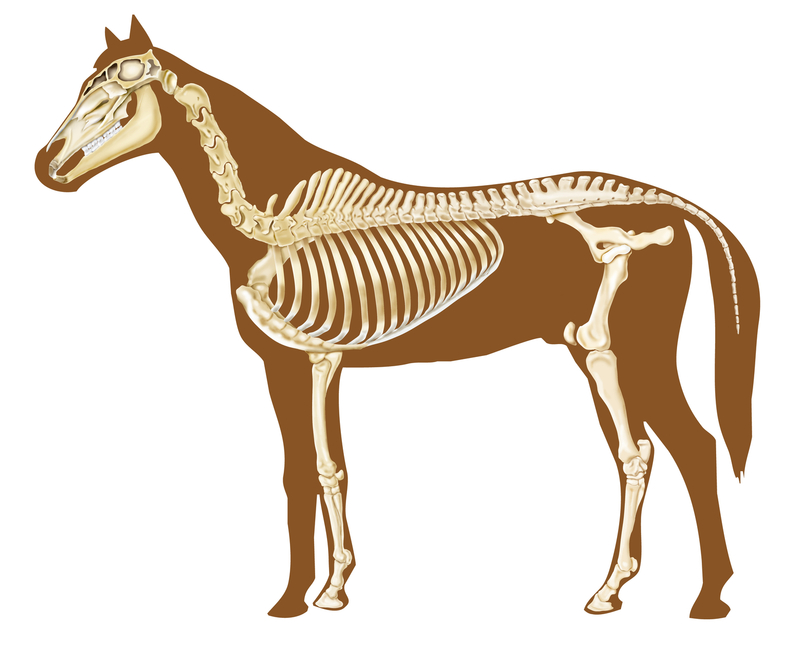 If enough Calcium is not provided in the diet the horse’s body will pull Calcium from other places it may have stored it, like the bones. Knowing this, as a horse owner I feel more confident that my horse has sufficient Calcium for phosphorus absorption with a ratio of 1.5-2 parts Calcium to 1 part phosphorus. How do I Get Correct Amounts for my Horse? As most of my readers know, I am a huge fan of a diet with a foundation of good quality forage. The case of Calcium and phosphorus supports this view. 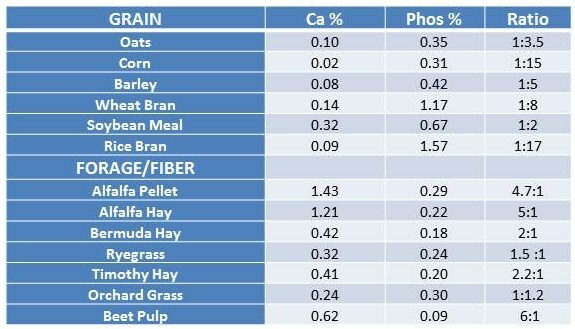 Table 2 shows the Calcium and phosphorous levels in common grains and forage. (Keep in mind these values represent an average and can vary from region to region). As you can see most grains are extremely low in Calcium and high in phosphorous. In order to balance a diet heavy on grain (which I hope NO ONE IS FEEDING) Calcium would need to be added to develop the proper ratio. Another thing to note is how the ratio in the forages are all naturally higher in Calcium than phosphorus; except orchard grass which is still at least adequate at about 1 to 1. The Calcium and phosphorus in forage is also more readily available to horses than that found in cereal grains. However, the Calcium and phosphorous in hay is dependent upon the fertilization and handling of the hay. Poor quality forage may result in different values. No discussion about Calcium and phosphorus would be complete without mentioning Vitamin D. The primary source of Calcium and phosphorus is the diet, but a number of factors affect how the body absorbs Calcium and phosphorus. These include the source of the minerals as well as the levels of vitamin D in the body. Vitamin D is obtained either through the diet or by exposure to sunlight. Because of the role it plays in the body, if the vitamin or its activity is decreased, Calcium and phosphorus absorption are reduced. Bone deformities can result, as well as other nutritional and metabolic complications. I was at a farm the other day that fed a diet of solely grass hay and ricebran. They did have their horses on a good quality vitamin/mineral supplement but when we did the ration analysis we discovered the ricebran (at a 1:17 Ca to P ratio) had caused the entire diet to be off. The farm owner was feeding the rice bran rather than commercial grain for weight gain because she thought her horses would get “hyper”. To fix the imbalance we reduced the ricebran and replaced it with alfalfa pellets to add calories and Calcium. We also added flaxseed oil to boost the calories without adding starch or sugars. This is just one example of how owners that don’t feed a diet of just forage, or one of forage and commercial feeds, can create problems with this ratio. I see it all the time with farms that mix their own feed. In these cases it is really best to have an analysis performed to see if the amounts and ratios are correct. If you want to be certain your horse has an adequate supply of these two important minerals, in the proper ratio, feed a diet of good quality forage or beet pulp balanced with a vitamin/mineral supplement. Both will supply more Calcium than phosphorus. 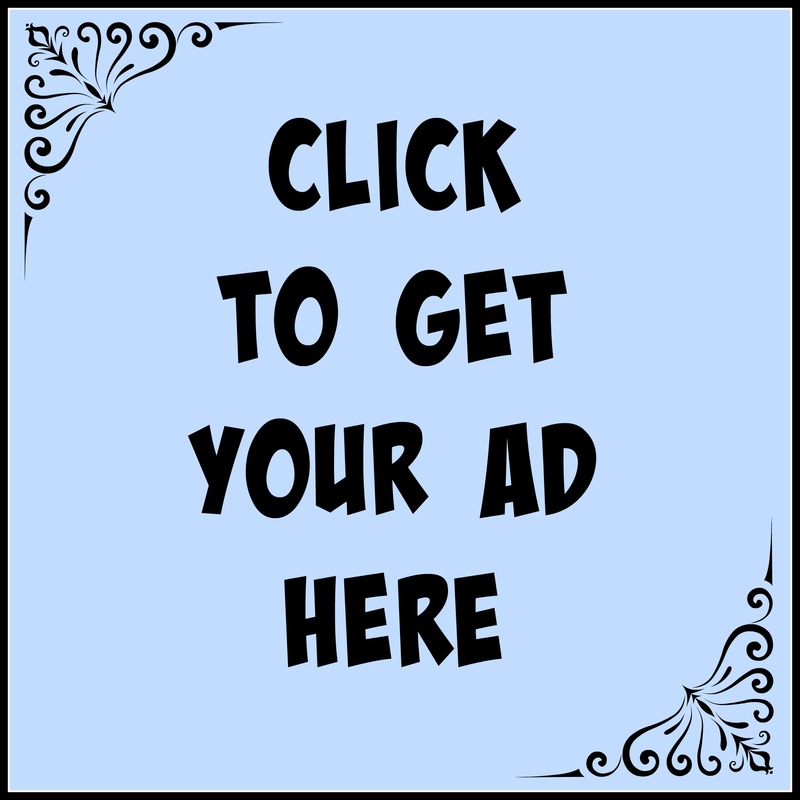 Formulated commercial feeds and oils can be added if a more energy dense diet is needed. Remember, if you just add whole grains, oats for example, attention to ration balance will be necessary. Great point Sara. I will delve into magnesium more in the “M”s but it is good to mention that magnesium supplementation depends in part on whether the soils on which a horse is grazing are deficient in the element. Any such deficiency will be reflected in the grass/hay grown. There are many factors in magnesium absorption and over-supplementation can be just as bad as a deficiency which I will expand on later in this ABCs series. What about too much calcium? I am changing to alfalfa hay to prevent gastric ulcers. My 34 yr old mare is on a low sugar high fiber complete feed (TC Senior). The alfalfa is making a 4:1 calcium to phosphorus ratio and I have read that senior horses can tolerate up to 3:1. Hi Mimi and thanks for writing. You do not need to switch to alfalfa hay to prevent ulcers if you are concerned about the calcium. TC Sr. is a complete feed meaning if you feed it in the recommended amounts no hay is needed for the nutrient value. Of course you’ll want to feed hay to keep the gut happy but it doesn’t need to be alfalfa. Any good quality hay will suffice.